A lot of this was rather tongue-in-cheek, but it does explain my reticence to engage with the expat community during my time in Korea, both in person and increasingly on the Internet. Today I'm talking about what I've learned about the expat community here - at least the Western expats anyway - because the migrant workers and immigrant wives aren't really the same community so I can't talk about them from personal experience. Jean-Paul Sartre once famously wrote that "Hell is other people", so today my topic is "Hell is Other Expats". 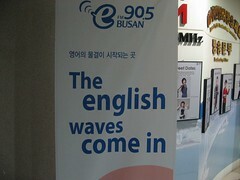 Before I started appearing on Busan eFM, I didn't have any interaction with the expat community at all. There aren't many foreigners living in the Saha-gu district of Busan anyway - and this was especially true in 2006 when I first got here. Evidently we were so rare that I asked myself what I would do if I met one. What is the social etiquette? Do we engage is some vague recognition of each other's presence? It was three days of walking around my area before I saw another Westerner - but only at a distance - and it was two weeks before I really came face to face with one. We were walking towards each other in an otherwise empty hospital corridor and there really was no escape. "This is it" I thought, as we approached. And then she smiled, and I ignored her. It seems you can't escape your upbringing - and you don't smile at strangers where I'm from. It didn't help that, as I recall, she was quite attractive, and women like that shouldn't smile at people like me - it's just cruel. Also, when that happens in that context, I'm just going to think some handsome Korean doctor is walking two feet behind me and it's him the smile is aimed at. So obviously I'm going to play it cool and not risk looking like an idiot. But there was no handsome Korean doctor. She probably recognised the fresh-off-the-boat look of panic on my face and felt pity for me. But I ignored her. So in the end I decided to ignore other foreigners - it's just too weird to behave differently. I did wonder if Koreans have this problem? A person could be Japanese or Chinese. Can a Korean recognise a Korean overseas? [Well, they say they always can and to suggest otherwise is to invite the conversation to become quite... animated - it's an issue loaded with significance which makes it rather fascinating]. It's only 2011 now - five years after the hospital corridor incident - but things feel very different now; there are so many more foreigners - in fact so many, they're pairing off and dating. I'm seeing more Western couples here now, which I never used to in Busan. I think foreigners here used to be so rare we were a bit like giant pandas. In fact I can't escape from that image in my mind - of a male and female Westerner locked up in a cage by the Koreans to see if they will breed together. But whatever happens in real life with the expats, that's not what worries me, because these days a lot of life isn't real at all - it's on the Internet. And in cyberspace, all the expats are together in one big unhappy community. In my first couple of years I read a lot of discussion forums here, mainly visited by native-English teachers. And let's just say that they created a certain impression of foreigners in Korea... namely the impression that they are slightly mad... or quite possibly completely unhinged in some cases. There was a lot of fuss a couple of years ago about foreigners being tested for AIDS when they arrived here, but it's quite possibly their mental health that ought to be checked on the way in. Or maybe they're fine when they get here, and it's Korea that turns you crazy. I was asked once why foreigners come to Korea, and I said I think part of the reason is because they don't fit in back home, myself included. Otherwise, why are we here rather than doing something productive with our time? Korea often seems to be a place where foreigners flail around as their career prospects back home gradually seep away. You don't have to play the career game but if you don't it marks you out as different in an adventurous, eccentric and strange way. From everything I've read I'd describe many other expats here as rather dubious characters. 'Dubious' is a very important English word. It doesn't actually mean anything, but it scares people every time. I always thought these dubious expats were mainly teachers; most are straight out of university, so they're young and inexperienced and think the world owes them a living. Then they come here, they're given an audience in the form of a classroom full of students. They get a lot of attention, and I think that causes some to fall into a kind of 'rock star' mentality. So I think it all goes to some people's heads. It's like when you read some saying on the Internet that they don't want to work for less than 25,000 won an hour. You don't need a qualification in Economics to understand it's just supply and demand - more foreign teachers here means less money. That's capitalism. There end up being a lot of arguments on the expat Internet and it can get really bad tempered. I mentioned that - before I came onto Busan eFM - I really made no attempt to mix with other foreigners, and part of the reason for that is reading all these people being rude to each other. We often complain about Korean netizens and how bad their behaviour can be when they get angry, but I'm not sure foreigners are really any different. So how it typically goes with angry foreign '외국인' netizens is that someone posts something about Korea on a discussion forum, and then it only takes a few posts (or less) for someone to become rude and then the insults fly back and forth. It's often like watching a battle of wits between two unarmed opponents - you grab your popcorn and watch - but it's also a depressing reflection on humanity in the end. But it's not just teachers, as there are other discussion forums these days for non-teachers in Korea and on one, for example, the moderators themselves are quite happy to engage in attacking other users and making sarcastic comments. So there's no incentive to post or participate in the community for me if that's the kind of environment they want to have. Perhaps civil discussion is becoming a lost art, both amongst foreigners and in Korea as well. Cyber-bullying has become a big issue in Korea in recent years, which has led to the launch of the so-called 'Sunfull' campaign of 'online etiquette' [which essentially encourages people to be nice to each other online]. Of course it's been prompted by the number of suicides which have occurred due to online bullying. The campaign has - apparently - attracted over one million messages, so it may have touched a nerve. The emphasis of the Sunfull campaign is on posting positive messages [it's actually got the potential to be quite sinister in that respect if you think through where that's going], but I think it would be a good start just to have people not being rude to each other online. Nobody wants to live in a society where you can only write positive things [not true - obviously it's a very seductive idea to some politicians and political groups in Korea and other countries, and later Busan eFM belatedly banned me from discussing certain subjects on air - more on this to follow], civil disagreement is an important part of our freedom but the trouble is many people seem to lack the education and intelligence to form reasoned counter-arguments - it's easier to be rude. I think one of the ironies of the Sunfull campaign though is that while politicians in Seoul are trying to encourage people to be civil to each other, at the same time media and politicians are launching some quite nasty attacks on Japan, sometimes there are fights in parliament, and it sets the tone doesn't it? I sympathise with Korea over the Dokdo issue but getting really angry about it is a big turnoff for foreigners and therefore actually counter-productive. If you look at people like Ghandi and the Dalai Lama, with reasoned non-aggressive arguments they drew many people overseas to their campaigns. Angry Koreans attacking foreigners just damages the image of Korea, and angry expats arguing with each other in discussion forums just damages the image of expats. I think expats need their own Sunfull campaign. I wouldn't set one up though because I really don't care enough - my solution is just to stop reading and posting on these forums. And anyway - foreigners aren't like Koreans. Recently I read that Korea was the 'fifth tightest society in the world' - meaning it's very restricted socially and culturally [actually it's the fifth out of 33 countries surveyed although the Chosun Ilbo went with the more salacious headline]. So whereas you might be able to convince Koreans to do something if the social pressure is there, if you suggest the same to foreigners they're probably just going to do the complete opposite instead. So there probably is no escape from the online Expat Hell. But not everything's bad. Rather than go crazy with hate and spend all their time arguing with people on the Internet, some foreigners turn to humour, and it's the interesting subject of expat humour that I plan to talk about next week. "a battle of wits between two unarmed opponents"
Makes one wonder how they type without arms? They must have some nimble toes. Very good post, I've read it with great interest. A lot of things you say about foreigners in Korea is true for the foreigners in Taiwan. The forums here tend to be stupid a lot of the times and I skip those, too. And I'm like you, I carefully choose which foreigner I meet (so far I've met only 1 in my 5 months here). I think we've seen the peak of the "white English teacher in East Asia" phenomenon, partly, because there are too many and the wages are getting lower and lower (and competition is increasing) and partly, because there's a lot of negative stories all over the web, which scares away potential newbies. I'm happy, that I work in IT and I'm not a native speaker, so I'm completely out of that community. But most of the foreigners here (and in whole East Asia) are judged by the unflattering stereotypes of English teachers, which is kinda sad. In Korea, there's the additional bad image of the American soldier. In any way, it's easy to get bitter over time, especially if you waste a lot of time reading those bitter blogs, that see everything so bad. I do criticize things in Taiwan from time to time, but not all of the time, as that would make me lose my credibility. Who likes an outside person coming to your house and then telling you how you should be and what you need to change? It's not easy to emigrate, leave everything behind and try to adapt to a society, that is so different and contradictory to oneself, but in the end we made our choice, nobody forced us. I don't wanna become dependent on living in Taiwan, I want it to be my choice. And so far I like it and I try to balance my opinions from two sides, the Western and the Eastern. Actually I need to, since I'm married to a Taiwanese girl and many times we have very different views on many issues. It's funny though, how quickly a blogging community jumps up and starts attacking, when you criticize them. Not sure about how it is in Korea, but when I wrote here http://mykafkaesquelife.blogspot.com/2011/06/taiwanese-blogger-jailed-restaurant.html about how some "famous" bloggers in Taiwan pushed a story without even reading the original source, I got a lot of heat, but also a lot of praise. It was a brief insight into the split community of those, who try to get to the bottom of some things and understand them before they judge and those who are just waiting for something "bad" to happen, so that they can push it and have an excuse to make themselves feel better in Taiwan, a country they don't particularly like to live in, but it's still better than back home. Thanks MKL. I'm sure a lot of the experiences of foreigners in Korea are shared by foreigners in Taiwan. I suppose I feel that there are three distinct communities of Westerners here in Korea - post-university native English teachers who come here for a year or two and then leave, and because many are transient they aren't necessarily concerned about who they upset. Then there are those who are making a longer-term career out of teaching English here, mainly because they married a Korean woman (as is usually the case), and then there's the rest of us - a small minority who have other jobs like you, and because of this we sometimes share little in common with the others. I guess there are the soldiers too, but they are far away from me in Seoul, and I gather that they venture off-base less and less these days for various reasons. Somehow, the forums here have just become a showcase for some of the worst in human nature and when I consider the fact that these people are meant to be university graduates it really makes me wonder about the nature of intelligence in modern society. It's interesting - and depressing - that the same seems to be true of Taiwan. I'm conflicted about my role here. I made my choice to move to Korea - although getting into a relationship with a Korean woman in England made it slightly less of a choice and more the hand of fate, but while I might not be Korean I see myself as a long-term stakeholder here, so I can be quite critical of certain aspects of life in this country. On the other hand, talking about some of these criticisms in the form of a weekly radio segment is an interesting exercise, because everything I have to say is effectively vetted as being fit to broadcast to a Korean audience by the Korean station management. I think that on the whole it is possible to be critical here as long as one can remain logical and civil. That said, I think your posting about the blogger in Taiwan who was jailed highlights the role Confucianism plays here in Korea as well, where criticism of important people or companies can easily get you into legal trouble, perhaps from the comments from the judge in that case, more easily than in Taiwan. And 'netizens' - Korean or Western - are always ready to follow the crowd an go on the attack rather than thinking things through for themselves and engaging in civilised debate. If it's any consolation, I'm a British-born Chinese bloke. But when I see another Chinese bloke - say at Tesco's, or on campus - we do seem to instinctively go out of our way to avoid each other or to avoid eye contact. I mean, unless we're in Chinatown. Then it's virtually impossible.